At Caballo Lake I finally got to meet Randy. He has been traveling for many years and had invited others to camp and visit if in the area. I had wanted to stop and visit whenever we crossed paths and Caballo Lake was my first opportunity. I also met CB, Tish, Myra, Carol and Laurie. They were fellow travelers who crossed paths at that time too. They all had been at the Balloon Fiesta too, and had such a good time. 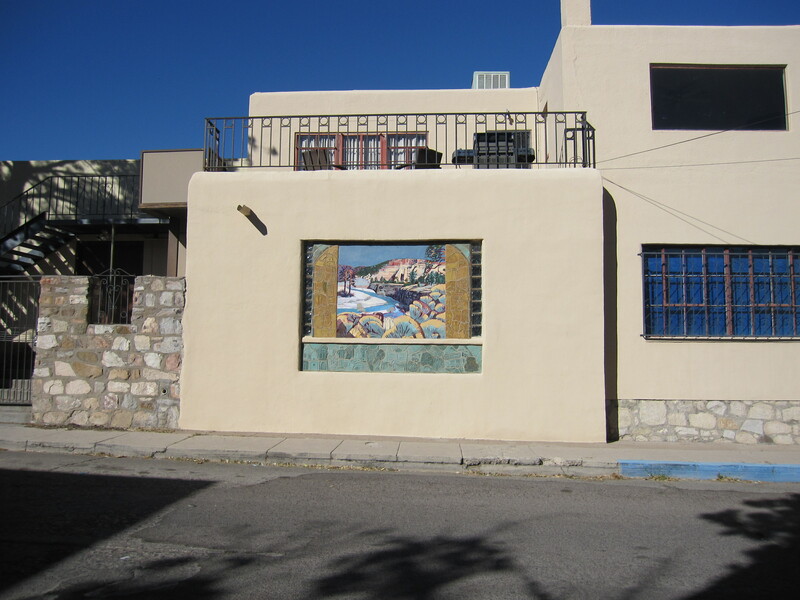 Maybe this year I will have to try harder to get to Albuquerque in October for the Fiesta. Anyway, we all had a great time. Mostly we each did our own thing, but would get together for evening walks, campfires, movie night, a couple of dinners, a trip into Truth or Consequences for errands, and various hikes. 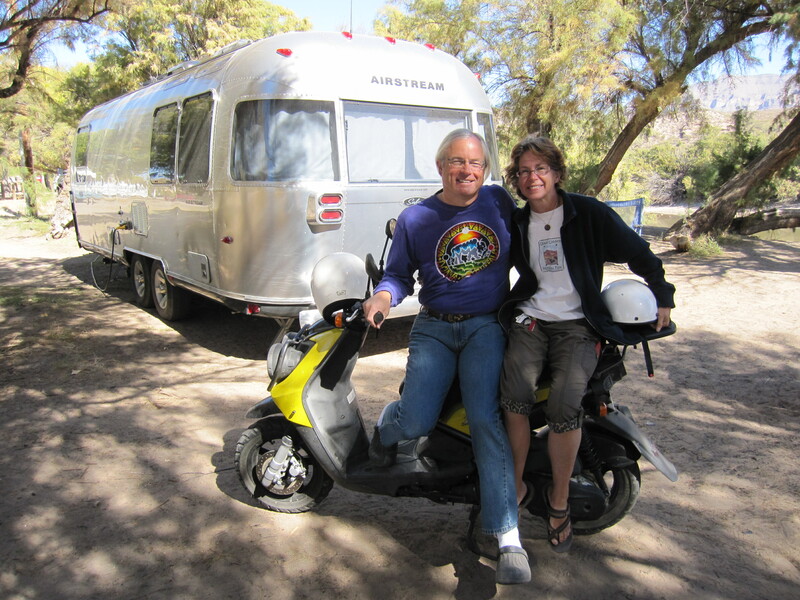 CB is an engineer and was helpful with some electrical issues/questions I had in my RV. Every morning about 7:00 we would see Sandhill Cranes flying from the Bosque del Apache to fields south of Caballo. It’s always cool to see lots of birds flying in formation. They are talkative birds! Yacking the whole way there and the whole way back. 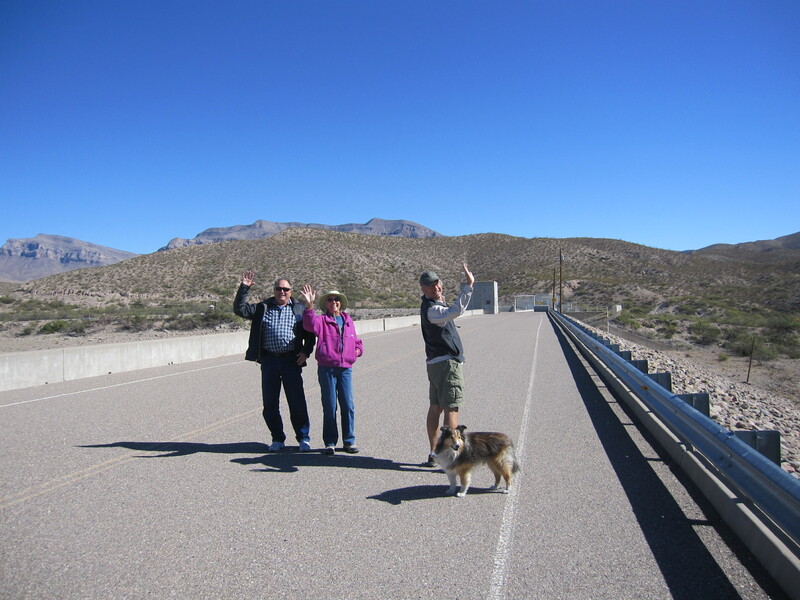 One day Randy, Carol, CB and I walked across the dam (it’s closed to cars) and walked in the desert on the other side. The dam was a great place to throw Riley’s ball. Hey, how about a fake wave? CB has a motor-scooter that I wanted to try out. It’s one thing I am considering for wheels if I don’t decide to tow a car. We kept putting it off, until the morning that I was leaving and we finally took a ride. Quick pic after the scooter ride. Next I wanted to go about 3 miles across I-25 to Percha Dam State Park to check it out for one night since it was so close. Then I was heading to City of Rocks State Park by way of Silver City. Tish was heading the same way, then on to Tucson. So we both left for Percha on Monday (10/29). 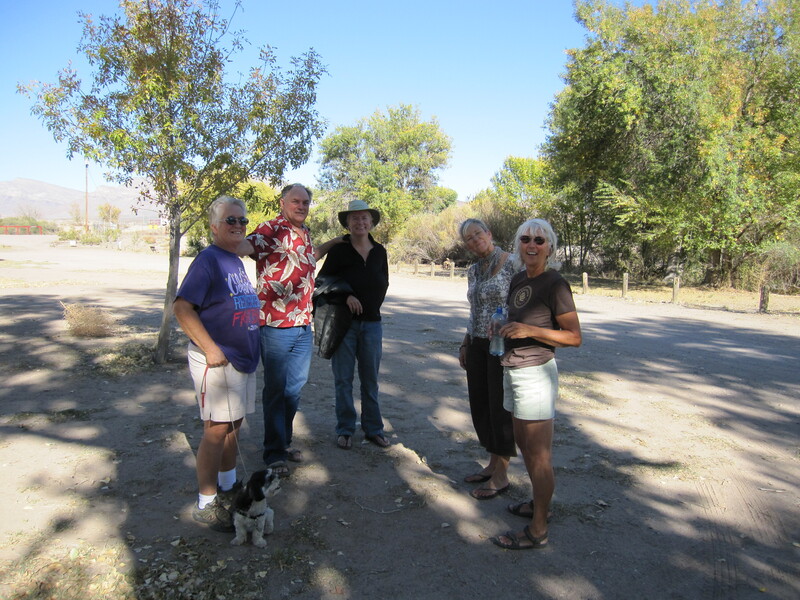 Chris, Randy, Laurie and Carol came by for a visit to see what the park looked like and we took a little walk in the woods by the dry lake bed. The next morning Randy came by to install some LED lighting in Tish’s RV that had just arrived. I plan to see Randy and most of the others in Quartzsite this month. The next morning we headed on to City of Rocks separately. I drove the pretty mountain route to Silver City for a brief one day visit and Walmart run. (Tish took a more direct route.) The downtown area has some really neat architecture. I arrived at City of Rocks late in the afternoon. Tish had already gotten a great site among the rocks. I tried to park nearby but couldn’t get level. Eventually I moved to one of the electric sites. I’m never crazy about parking right next to other RV’s in a line, but I had electricity, so that was worth it. The crazy rock formations are from volcanic ash, sculpted by erosion. The weird formations reminded me of scenery in the old TV show “Lost in Space”. The cool thing about Tish’s site was she was warm at night (the rocks radiated the retained daytime heat) and was cool during the day (had cooled some overnight and provided shade), so a very temperate location. We were there 2 days, then I said ‘see ya later’ as I was going on to Deming and Rockhound State Park and Tish was heading to Tucson after one more night at City of Rocks. We hoped to meet up again when the group gets together in Quartzsite this month. This entry was posted in New Mexico, New Mexico State Parks by ontheroadwithriley. Bookmark the permalink. Thanks Maureen! Adding Karchner to my list of places to visit.